A major new campaign to end the use of monkeys in European laboratories is being launched in Barcelona today. This event is open to the press and the public will include a screening of the documentary Save the Primates introduced by MEP Raúl Romeva and will unveil what the campaigners hope will be the biggest awareness drive on the use of primates in experimentation that Spain has ever seen. ADI and Animanaturalis are also launching a new all Spanish Save the Primates website where people will be able to view the documentary, download information, sign the new petition, and send a message to Council of Ministers and European Parliament. The campaign aims to increase pressure on the Council of Ministers who are currently considering Europe-wide rules on animal experiments. 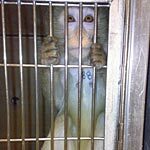 The European Commission have proposed restrictions of primate experiments and a crackdown on the wild capture of primates by dealers supplying European laboratories. Campaigners will be calling on the Spanish Government to strengthen these measures at the Council of Ministers. Spain is a key battleground for the protection of primates in laboratories. In 2007 almost half of Spain’s MEPs (46%) backed a call to end the use of apes and wild caught monkeys and to establish a timetable to phase out experiments on monkeys. A facility at Camarles south of Barcelona, which has faced huge local opposition, is a European distribution centre for thousands of monkeys from Mauritius where wild monkeys are regularly trapped. The Camarles monkeys are reported to be the offspring of wild caught monkeys – a cruel trade the European Commission have proposed be phase out in seven years. ADI and Animanaturalis plan to increase political support by engaging the Spanish people in this debate with petitions in city centres, online and a special postcard campaign. Animanaturalis Activists Coordinator, Aida Gascón, says: “The industry and labs hide a very cruel reality for the animals. We hope that with this campaign thousands of citizens will not only be aware of this situation but also take an active stand, writing letters and protesting against animal maltreatment. The animals do not have a voice and need to be defended."